CONSUMER outlook improved for the first quarter of 2019, results of the quarterly Consumer Expectations Survey (CES) of the Bangko Sentral ng Pilipinas showed. 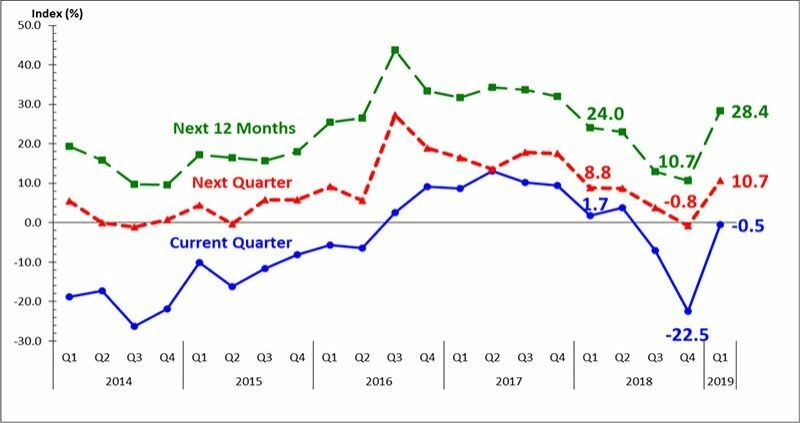 The overall confidence index (CI) rose to -0.5 percent from -22.5 percent in the fourth quarter of 2018, registering the all-time largest quarter-on-quarter increase since the start of the nationwide survey in the first quarter of 2007. According to respondents, their improved outlook during the current quarter was mainly brought about by their expectations of additional/high income, improvement in peace and order, availability of more jobs and good governance. Improvement in the consumer sentiment was carried to the subsequent reference periods as the next three months CI reverted to positive territory at 10.7 percent from -0.8 percent in the previous quarter, and the year ahead CI rose to 28.4 percent from 10.7 percent in the fourth quarter of 2018. Similar to the current quarter, the consumer outlook was more upbeat for the next quarter and the year ahead due to expectations of additional/high income and availability of more jobs. Further, respondents anticipated stable prices of goods and salary increases for the next 12 months. “The higher, albeit negative, CI indicates that the number of households with optimistic views considerably increased, but was still lower than those who think otherwise,” the BSP said. The CI is computed as the percentage of households that answered in the affirmative less the percentage of households that answered in the negative with respect to their views on a given indicator. A positive CI indicates a favorable view, except for the inflation rate, the peso-borrowing rate, unemployment and change in prices, where a positive CI indicates the opposite. The overall consumer CI measures the average direction of change in three indicators—overall condition of the economy, household finances and household income. The Q1 2019 CES was conducted from Feb. 5 to 16. The CES samples were drawn from the Philippine Statistics Authority (PSA) Master Sample List of Households, which is considered a representative sample of households nationwide. The improved consumer confidence was observed across the three component indicators of consumer confidence, namely, the country’s economic condition, family financial situation, and family income. Notably, the CIs for economic condition and family income posted the largest positive changes in their respective index levels since the start of the survey. Likewise, for the next quarter and the year ahead, consumer confidence, as measured by the three component indicators, improved. In particular, the next quarter CIs for economic condition and family financial situation reverted to positive territory and the year ahead CIs for family financial situation and family income registered the biggest upsurge since the start of the nationwide survey.